If you went shopping with someone in Phoenix before the 1920s, probably you would have seen them go into a store, pay nothing, and leave empty-handed. Today, this seems ridiculous, but it explains the concept of "cash and carry", which replaced the old system of "pay later and have it delivered". 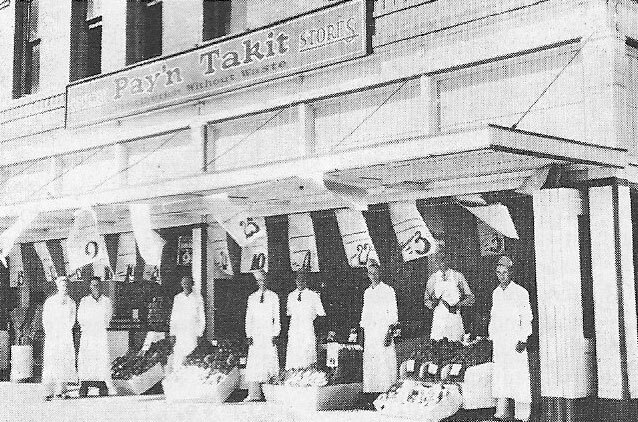 In Phoenix, a typical store to do "cash and carry" early was Pay'n Takit. Unless you rode into town in a buckboard, delivery was expected from any grocery. This is how it worked: You walked into the store with your list, the clerk filled the order (you didn't walk around the store and pick up things), it was put on your "tab", which was credit given by the store itself, free of interest, and delivery was arranged, usually the same day. It was a wonderfully convenient system. Unfortunately, it had costs associated with it, as you can imagine, that 20th century marketing experts saw as wasteful. And if the free delivery, and the free credit, could be eliminated, prices could be lowered while still retaining a reasonable profit. And they were. Of course, the first time people saw this they were outraged. "Pay for it now? What? Don't you trust me? And carry it myself? It's unheard of!" But the prices were made lower through this process, so it caught on. So much so that it's hard to imagine a time when people didn't Pay and Take It.